There are many different mall kiosk business ideas for retail. Jewelry display as a luxury product is always considered a high-level representative. So, the kiosk design must match with the theme of the product. 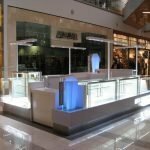 How to get a unique design for your jewelry retail business? What’s the best idea for your gift retail store? Today, we have a very cute design concept for you. Here goes the Top design mall used Jewelry retail display kiosk gift kiosk for sale. Detail Products Feature of our gift kiosk. Widely usage for this retail kiosk concept, such as the shopping mall, retails store, shop-in-shop, showroom or museum that need retail display showcase. We use High-end material, fire-resistant plywood, durable laminations, natural veneer, stable structure, etc. Provide free 3D design service and our design can fully implement your idea into reality. You just need to share us what you need, we will do the rest work. Since it’s overseas order, we cannot install on site, but we offer Easy install function that will solve hassle and rework. Here below are two images of this gift kiosk concept, You can use this gift kiosk for gift retail, anniversary products retail or jewelry retail. 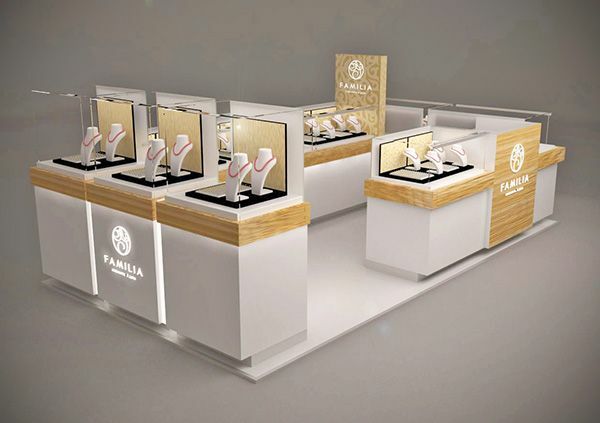 With three freestanding pedestal stands, you can also use for watch display or diamond display. The full kiosk stands are finished with white and wood. This combination gives a natural style while the white makes the kiosk clear and neat. Due to the size limitation, you can not have too much display area. But on the back part of each display showcase, We have enough storage for you. On one hand, the display can express the theme very well. On the other hand, the LED logo in front makes the design more outstanding. The material used: MDF, American OAK wood veneer. 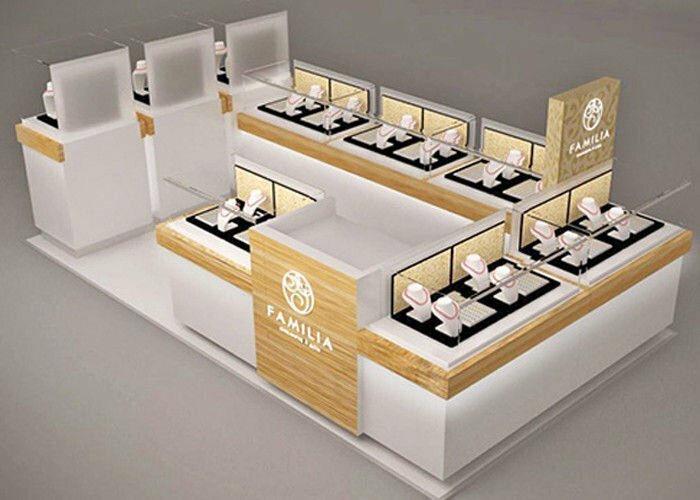 The Brand of this jewelry kiosk is FAMILIA. Even though it’s a small kiosk in the mall, We manage to adapted a small cash retail counter with a till stand. With a cash reception counter, this kiosk can be a whole project. Looking for more different jewelry kiosk design? Browse our category and you will find your ideas kiosk ideas. No matter gift kiosk or gift display stands, we have a large variety of options available for you. Even you do not like any of our concepts, Do not worry, We have experienced team can custom a kiosk for you.